I hope you all had a great weekend and had a chance to get creative and make a card or two to celebrate World Card Making Day! 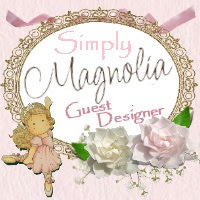 I am very excited about today's post as I get to play guest designer over at House Mouse and Friends Monday Challenge!!! Thank you so much to all the gals at HM&FMC for inviting me to guest design! The challenge this fortnight is 'ATC turn about' - include an ATC on your card. Just in case you are not familiar, ATC stands for artist's trading card and is basically just a little piece of art that measures 2.5 by 3.5 inches. I used Feeder Friends, which is a gigantic stamp, and masked out all of the branches and flowers so that only the mouse and birds at the feeder were left. I coloured the image with distress inks using almost every shade of brown available along with black soot, scattered straw and wild honey. I then used the masking technique again to stamp the background with a wood grain pattern. I wanted to give the glass a shiny glassy look, but remembered (after bleeding it a little - oops!) that Timber brown Stazon does not hold up to anything except water. So, I cut out a transparency film in the shape of the glass and covered it with Goosebumps spray, which has a beautiful shimmer and dries nice and shiny. Once it was completely dry, I peeled it off of the film and pressed it down on the image. It has just enough stick to stay put, but will peel off if you try to lift it. This photo captures a little of that shimmer and shine. To finish off my card, I framed the ATC with twigs. Picking twigs was a great fun to do with my two year old - he loved it! I printed a computer generated sentiment onto a TH banner, added some twine, a wood grain button, and some feathers. The top corner felt empty so I grunged it up with a couple of stamps and added some pearls. 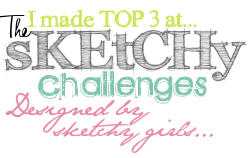 Be sure to pop on over to the House Mouse and Friends Challenge to be inspired by their talented design team. 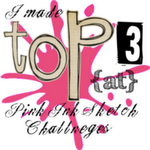 I hope you will be able to play along and am looking forward to seeing all of your creations! Thanks for visiting and for taking the time to leave a comment! I love having the chance to visit you back. Happy Thanksgiving to those celebrating today! Have a great week! Dawn, what a beautiful card you created, and those feathers are the perfect touch for this image. Birds are surprised to see that cute little house mouse in their bird feeder, so darn cute. Great job, really vintage looking. Beautiful. This is so warm and cozy feeling. Fabulous card. Wow, this is just amazing. I love how you framed the ATC with the branches, is stunning! 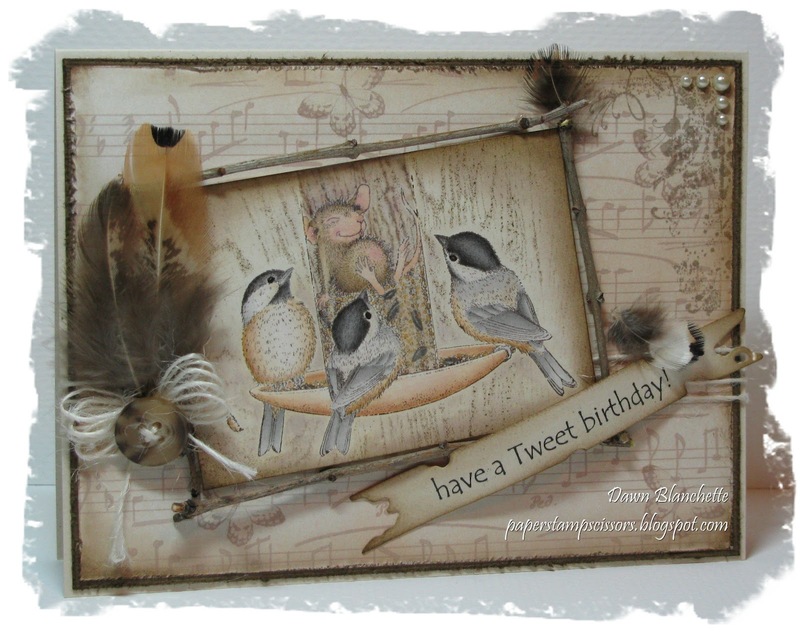 Such an adorable card Dawn, your image is so sweet and beautifully coloured. I love the beautiful colours and papers..........your details are just stunning, especially the feathers!! This is really gorgeous Dawn, I love every element and the image coloured beautifully too. Thanks for joining us as a GDT. 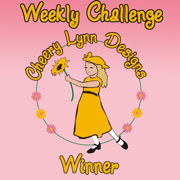 lovely card thanks for joining us at charisma this challenge! So much detail! I love the feathers :) Congrats on the guest DT spot! Hi Dawn what a clever take on the ATC turn around chall theme..lovely soft colour combo great colouring & this sweet image all round stunning HM creation..thanks for your contribution at House Mouse chall as our Oct GDT.. 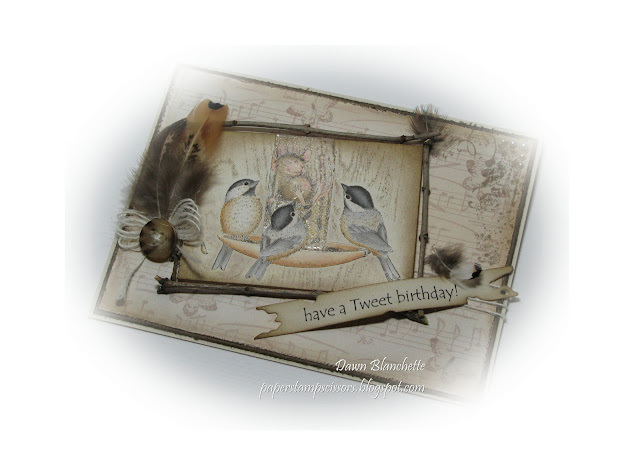 This is the sweetest card with those birds, and the feathers look wonderful! Well done!